The Peoples Committee of Quy Nhon – Binh Dinh, licenses the Nguyen Nga Center as a privately operated, non-profit organization that performs humanitarian and social work utilizing volunteers. 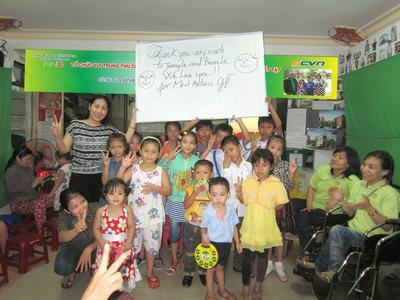 In 2005 the NNC came under the sponsorship of the Association of Disabled People and Orphans of Binh Dinh Province and is now known as “Sub Group Nguyen Nga”. This was necessary because in Viet Nam there is a requirement to organize all local groups and private organizations for social activities with a government agency. However the Nguyen Nga Center retains self-governance of its operational activities, staff recruitment, organization and fiscal support. • The Management, staff and members of the individual groups have meetings at least every 6 months for development of future activities and to compile a bi-annual report of Center activities. • The Manager and Management Staff of the NNC have bi-annual meetings to evaluate the performance of the current year’s activities and develop plans for the next year. • Management and permanent employees of the center meet daily, weekly and monthly to assess and refine operations as indicated. • To enhance the professional skills of staff members and teachers there are 2 to 3 training courses provided during the year and at least 2 to 4 unscheduled inspections that encourage the sense of responsibility.